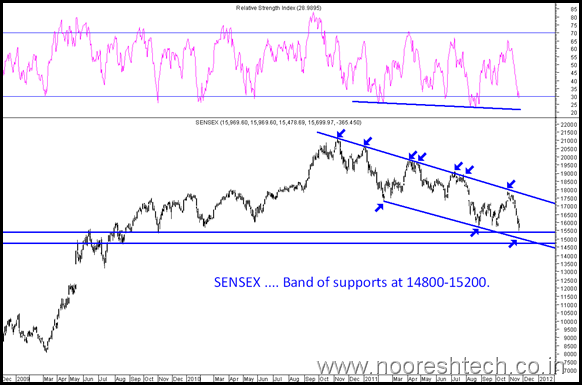 Nifty 4450-4550 and Sensex 14800-15200 are strong support zones. Buy on declines but slowly in quality stocks. Here we see that there are cluster of supports between 4450-4550 levels ( 4 reasons given ) from where Nifty should bounce back atleast till 38.2% retracement level of the entire fall from 5400 as it has done in previous major falls in this falling parallel channel that could be closer to 4800-4850 levels as a bounce back target. 2 ) 50% retracement of entire rally from 2550 to 6350 is placed around 4450. 3) RSI - highly oversold, at same levels where previous important lows in Nifty were formed. We are near to 28. Generally we bottom at 24-26 levels. Now similar chart for Sensex is below. 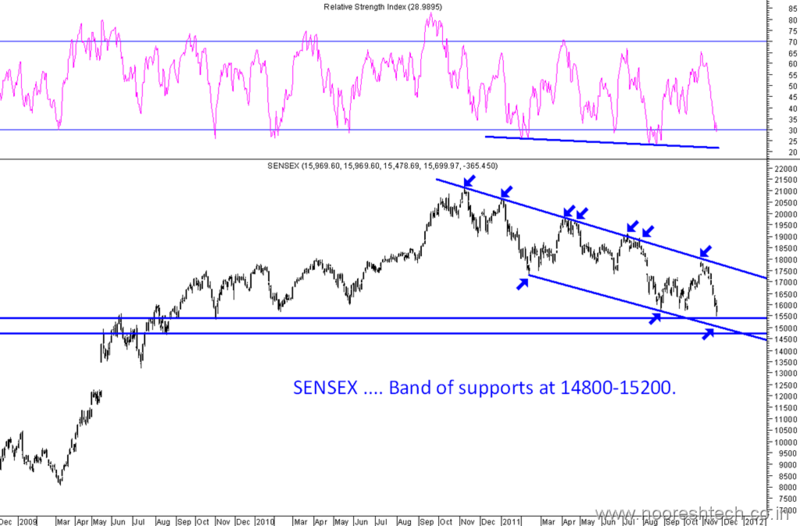 14800-15200 band should support. Sir kindly suggest some quality stocks that we can buy. Have been suggesting many stocks like nesco,smartlink,godrej,aditya birla nuvo as good bets. One may now even look at Ashok Leyland at 24 levels with a 4 % div yield. Escorts may be a moderate risk high return bet. Technically i would still wait to bet on momentum trades. do you still prefer Ambuja Cem. at this price as defencive bet? 1. FSL, currently trading at 8 rs, company is in profit throughout but just cannot sustain. What issue you see in this and can a quick bounce be expected. Also horizon for 1 yr and i hold this stock with avg price of 33 Rs. Fundamentally many doubts on the cos.
Also lets wait for some turnaround signals. But a must keep in radar. sir i want to buy bgr energy @200 for small pullback,, is it good idea..
Will prefer to wait for turnaround signals. Whats ur outlook on Patel Engineering ? can you guide me on diamond power infra, shriram transport finance and solar industries. can we start buying these stocks at current levels. 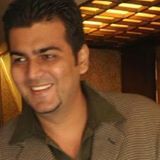 SR, I M NEW TO THIS STOCKMARKET,I AM TRADING IN COMMODITY , BUT FROM UR SITE ,I AM GOING ENTER IN THIS MARKET.